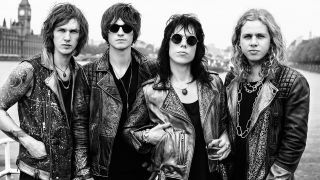 The Struts have announced the details of a new version of their debut album, Everybody Wants. It’ll be released on March 4 via Polydor/Interscope, and features several new tracks, plus remasters and re-recording of songs from the 2014 original. “Everybody Wants is a collection of songs for the disenchanted,” says frontman Luke Spiller. “When putting the album together we have approached it with the mindset that when listening, you are taken on a journey. You can even hear the album title in the chorus of the opening track Roll Up. This song gives you the insight to a larger than life character that opens the door to the rest of the album. Everybody Wants is released on March 4. The band go on tour in the US later this month, with festival shows to follow (dates below).